Sept. 14, 2011, 11 a.m.
York, director for international freedom of expression at the Electronic Frontier Foundation, writes about how the role of Facebook and Twitter in spreading information continues to evolve after the Arab Spring. 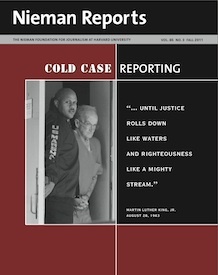 By Jillian York Sept. 14, 2011, 11 a.m.
Editor’s Note: Our sister publication Nieman Reports is out with their Fall 2011 issue, “Cold Case Reporting,” which focuses on process of revisiting old investigations to tell new stories. Over the next few days, we’ll highlight a few stories from the issue — but go read the whole thing. In this piece, Jillian York of the Electronic Frontier Foundation — and until recently of Harvard’s Berkman Center — writes about how Facebook and Twitter have filled a vacuum left by traditional media in the Arab world. In the wake of the Arab Spring, a vigorous debate is taking shape. While Facebook and Twitter are recognized broadly for playing a pivotal role in broadcasting information from inside the demonstrations in Cairo’s Tahrir Square and elsewhere, views differ on the fit they will — or should — have in territory that has been the traditional reserve of journalists. Throughout the Arab region, web forums — general and themed — have long served as hosts for civic discussion. These online spaces held the place of social media before global sites like Facebook and Twitter came along. From 2004 to 2007, when I lived in Morocco, Facebook was nascent, still closed off to users outside certain networks, and Twitter, launched in 2006, had not yet emerged. Blogs were still new, so much so that the Moroccan blogosphere, now a force to be reckoned with, consisted of just a handful of largely disconnected writers posting in diary style, dipping briefly into politics or sports. It was Yabiladi, Bladi, and others — Morocco’s forums — that were sources of unreported news, discussion and social commentary. Morocco is not a dictatorship like Tunisia was before its revolution or as Syria remains today. It is a parliamentary monarchy with democratic norms followed to varying degrees, depending on the issue at hand. Its press is considerably freer than that of its neighbors in the region, with only a few off-limits subjects such as Islam, the king, and the Western Sahara, to name a few. Yet a few journalists there do broach even the most taboo subjects, sometimes to the detriment or demise of their careers. POSTED Sept. 14, 2011, 11 a.m.